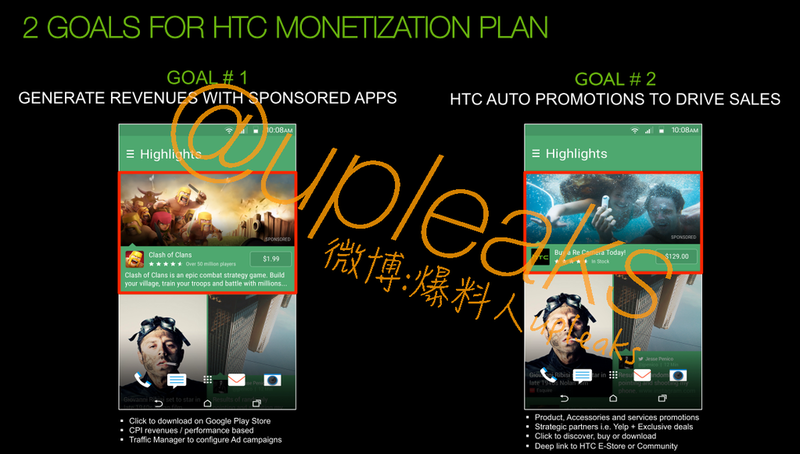 According to tweet from @upleaks, along with alleged photo evidence, HTC may soon infuse sponsored apps and HTC promotions directly into BlinkFeed, making it the newest possible source of income for the company. In the photo that was posted online, two screenshots are shown with what end users may see when HTC updates the social network feed service. At the top of the Highlights section, which usually shows trending news and information, HTC will place sponsored ads, such as Clash of Clans, right on top for all users to see. In addition, when not showing ads for apps, HTC will promote its own products, like the RE Camera. As of right now, BlinkFeed is used to show Facebook posts, tweets, top news, and other social happenings from around the globe. If implemented, this would be HTC’s first attempt to make actual money from the service, which could lead to a bad taste in the mouth of users. It is unknown at this time if users will be able to disable the ads and promotions. Personally, this move by HTC would not shock me. One M9 owners already receive “suggested” app downloads via the Smart home screen widget, so it could be likely HTC does not stop at just BlinkFeed. To HTC users, do you use BlinkFeed? Would this turn you off from the service?